How do people become activists for causes they care deeply about? Many people with similar backgrounds, for instance, fervently believe that abortion should be illegal, but only some of them join the pro-life movement. By delving into the lives and beliefs of activists and nonactivists alike, Ziad W. Munson is able to lucidly examine the differences between them. Through extensive interviews and detailed studies of pro-life organizations across the nation, Munson makes the startling discovery that many activists join up before they develop strong beliefs about abortion—in fact, some are even pro-choice prior to their mobilization. Therefore, Munson concludes, commitment to an issue is often a consequence rather than a cause of activism. The Making of Pro-life Activists provides a compelling new model of how people become activists while also offering a penetrating analysis of the complex relationship between religion, politics, and the pro-life movement. 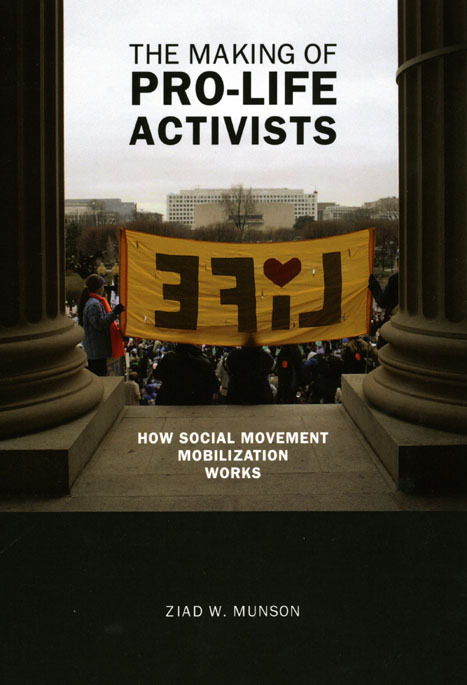 Policy makers, activists on both sides of the issue, and anyone seeking to understand how social movements take shape will find this book essential. "What a fine book Ziad Munson has written. The Making of Pro-life Activists is not only one of the most serious and balanced books on the right-to-life movement, it also illuminates the dynamics of social-movement mobilization well beyond the abortion controversy."